The Green 'Team Superhero' Girl ran the Awesome 80's 5k this weekend. As I mentioned earlier this year, I was selected by the Superhero Events Super Crew to be a Team Superhero ambassador. My Madonna tank and lace fingerless gloved friend, Janey, and I arrived at the Rose Bowl a few hours before the race to help with bib pick-up. 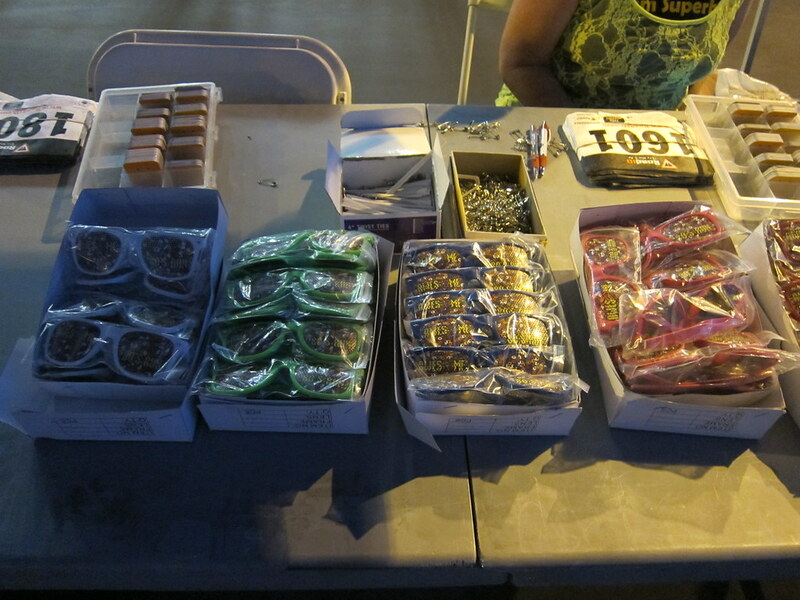 Our table was responsible for bib numbers 1 through 400. Janey thoughtfully pre-stuffed safety pins and twist ties into the goodie bags in preparation for the runners. 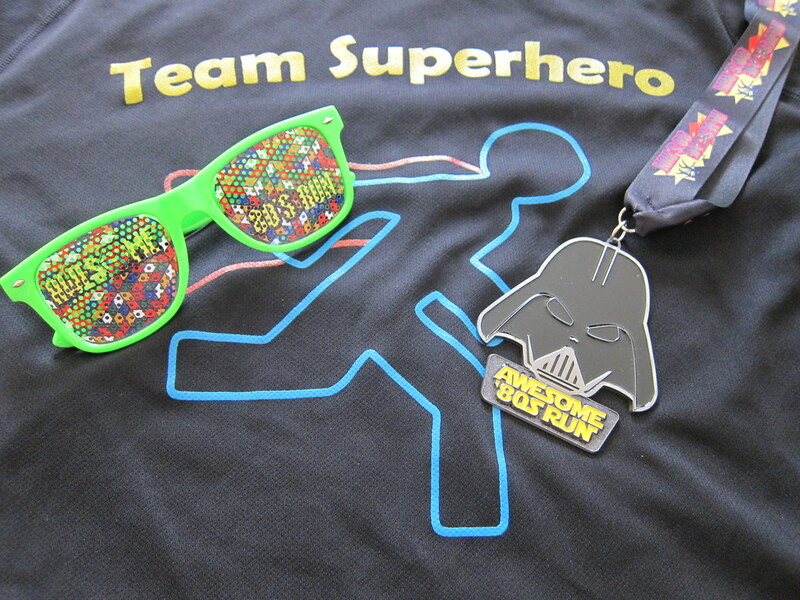 Each participant received a bib, a timing chip that was to be returned at the finish line in exchange for a Darth Vadar medal, a goodie bag, Awesome 80's sunglasses, and a race shirt. OneFitJam! Jam & Be Fit! provided 80's themed entertainment for the event. 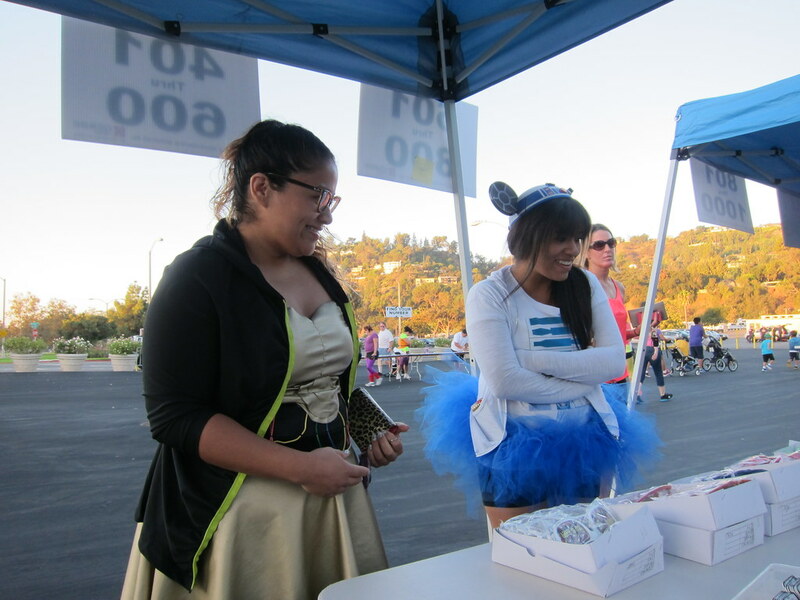 It was so much fun to see the creative costumes as runners picked up their race packets. We saw Chewbacca, Storm Troopers, C-3PO, and R2-D2, Star Wars. 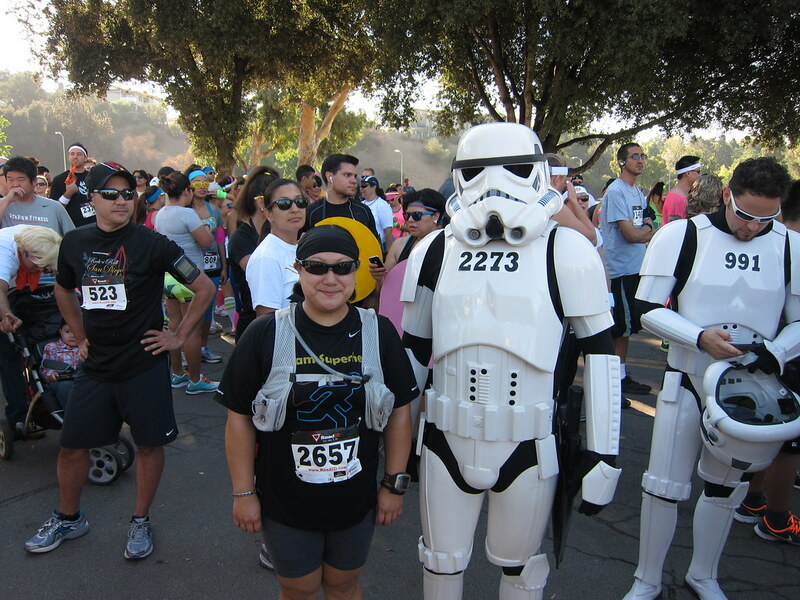 Race Director, Sabrina, was Princess Leia. 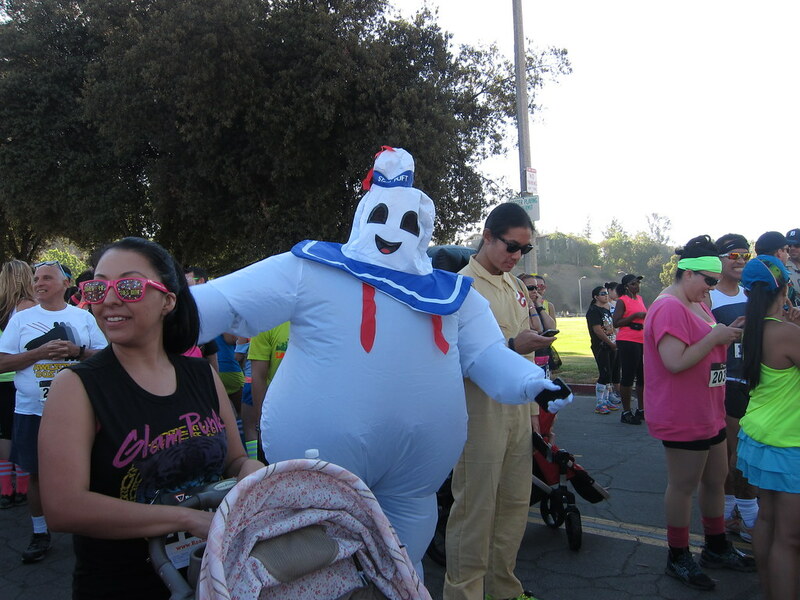 In addition to all the 80's character costumes, there was a also sea of runners wearing tights, leg warmers, leotards, and headbands/scrunchies - in all shades of neon. I couldn't help but wonder how many runners were wearing authentic 80's garments and how many made a last minute trip to American Apparel for this race. 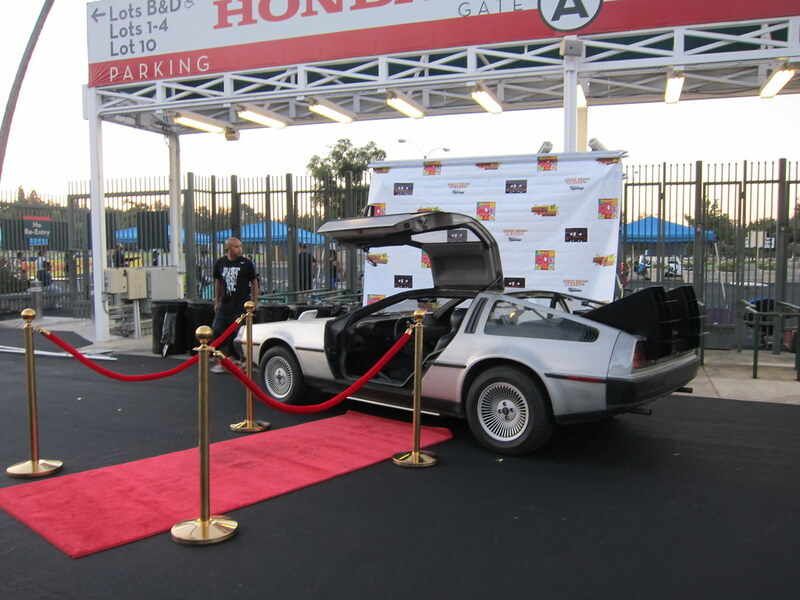 The Back to the Future costumed runners must have felt right at home with a DeLorean parked in front of the Rose Bowl. We saw Marty McFly and marveled that he was running 3.1 miles on a warm day with a wig and an orange vest. We also saw the entire Ghostbusters crew along with the Stay Puft Marshmallow Man. The Ghostbusters carried inflatable Proton Packs on their backs. 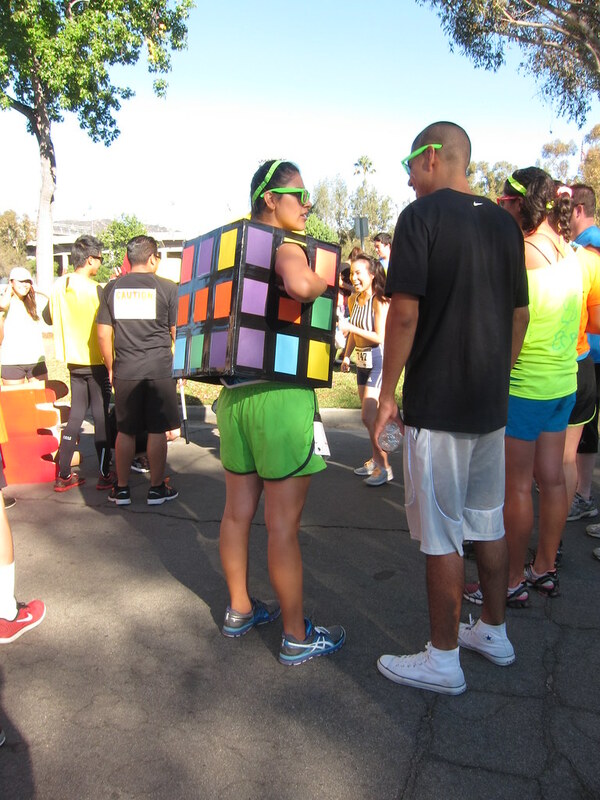 My favorite costume idea was the Rubik's cube. 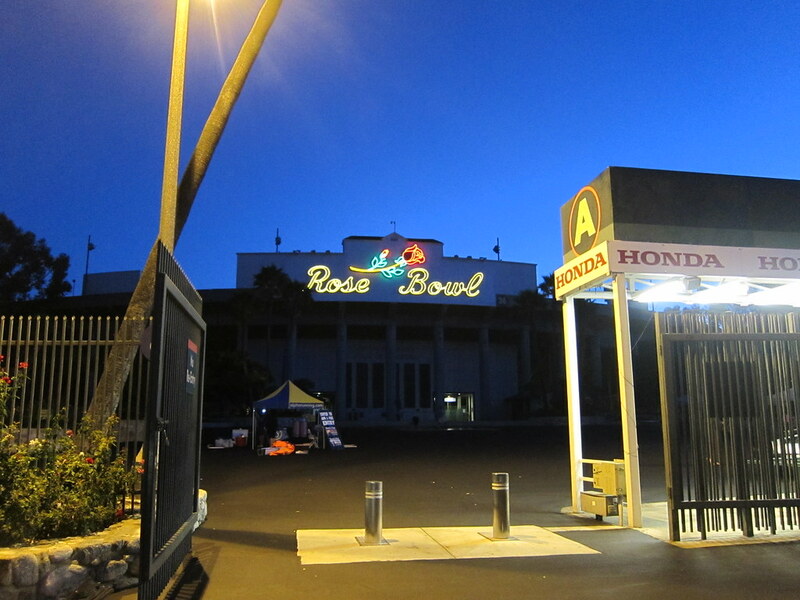 The 5k route circled the Rose Bowl Stadium. The course started out with a gradual incline. Instead of a band, the first group of entertainers were doing burpees. I was impressed they were going all out with their workout on the blacktop. Out on the course, we saw quite a few Teenage Mutant Ninja Turtles running. Cowabunga! My left calf was tight and I had to take a few walk breaks due to cramping. In the last mile, I even stopped to stretch on the grass. I was most impressed with the authentic-looking Storm Trooper costumes. I had to stop and get my picture taken with one of them. Race director Ken's alter ego, Michael Blackson MoonRunner, was at the Finish Line congratulating the finishers and posing for pictures. I had a lot of fun and was proud to represent Team Superhero at the Awesome 80's 5k. Great recap! I love the pic of you and the Stormtrooper.... it was so hot... I wonder how they ran with all that stuff on! I know, I had to stop and get a picture with the Storm Trooper. So awesome. I have no idea how they made it 3.1 miles in that costume! This looks like so much freaking fun! It was! As I was running, I was giggling at all the outfits. Thanks for talking me into going. It was a great day! I've never worked bib pickup before, so that was a bonus to the day. I'm so glad you joined me and I truly appreciate you helping out with the packet pickup. I did this one last year and it was SOOOO hot. I was in pasadena on Saturday this year too, and it was still pretty brutal. Those storm troopers must have broiled! Thanks for your recap. It was good to see you and Janey in the neighborhood. This race seems like a turnaround from last year.